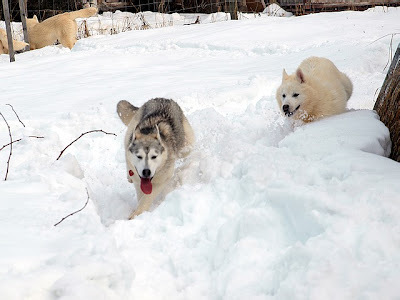 Iceman plays "catch me if you can" with his brother Inuk (both are from the "I" litter after Mouse x Nugget), Lucky (Star x Canuck) and sister Modra, who´s trying to catch up. 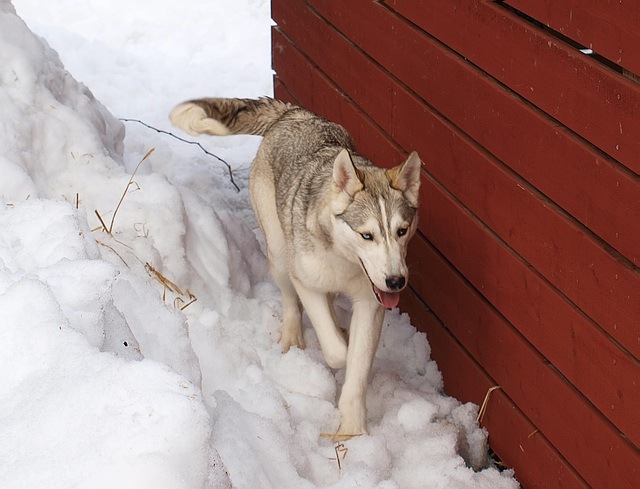 Maggie grew into a clone of her mom Rizey, and into a pretty and super fast 7 months old young lady :) For those of you, who remember - she is from the Northern Exposures litter, born this past September (Rizey x Balto). Chip is from the "CH" litter born in June, out of Star x Canuck. This is "Grandpa" Coryuk. 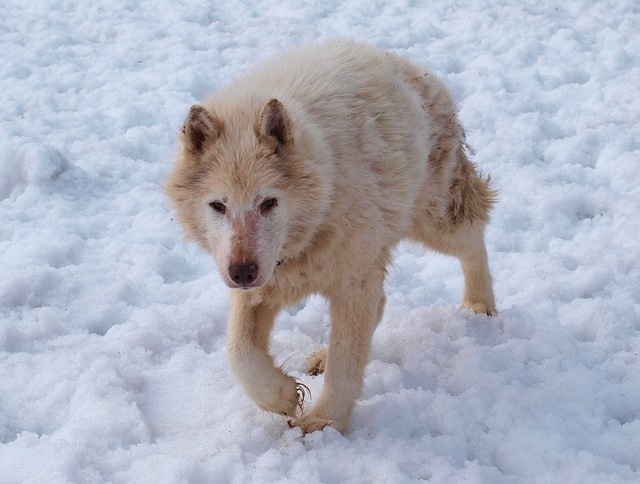 He looks not so good this time of the year - changing his wool-thick coat and losing some of his nose hair, mainly due to his favourite hobby (and bad habbit) of rubbing his nose against almost everything. 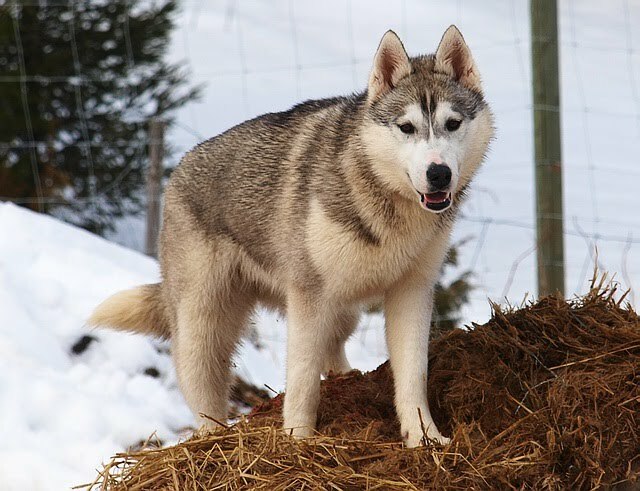 The newest member of our family - Grayling (Buck x Jee-Haw) from the "G" litter, which will, unbelieveably turn 4 years this upcomming June! Where did all the time go?!! If you have a feeling that Babeli doesn´t look too happy to you, you are right. 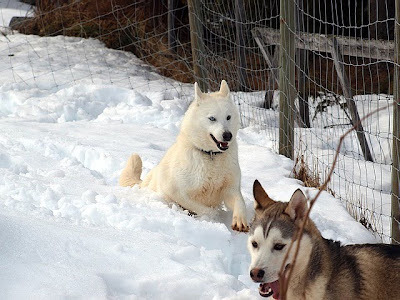 She is very enoyed when the youngestrs play infront of her house, or simply anywhere near her. She´s been such a grouch ever since I can remember. Although she turned 11 this past September (now, that one I don´t wanna believe at all! ), she is still super fast and driven in the team, and performs excellent. 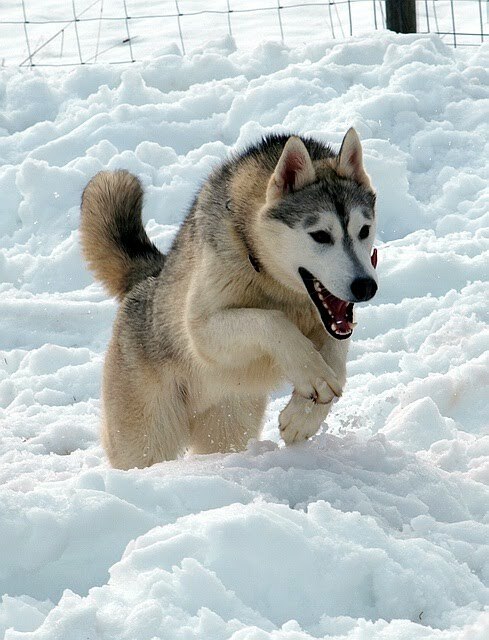 Running and pulling sled is still a passion for her, and she shares that passion as equaly with her love for the sofa. 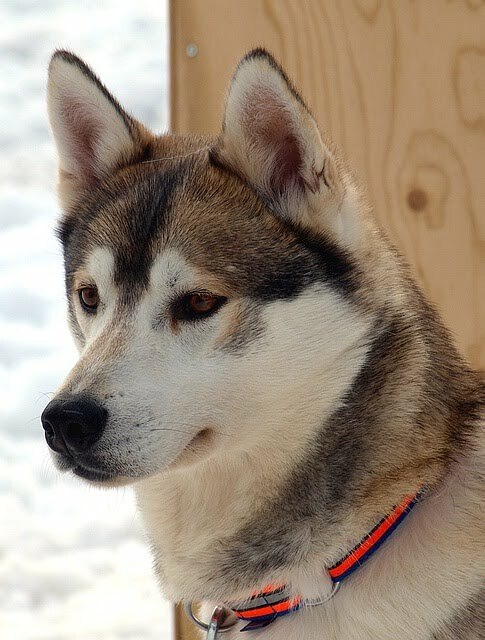 If all goes well this summer, I´ll have a great puppy coach and leader of the yearling team in her, for the next season. Iceman (Mouse x Nugget son from the "I" litter born in October), chasing Chip. This arctic wolf resembling dog has a unique story to tell, which I will share with you in one of the next posts. The old and the young. 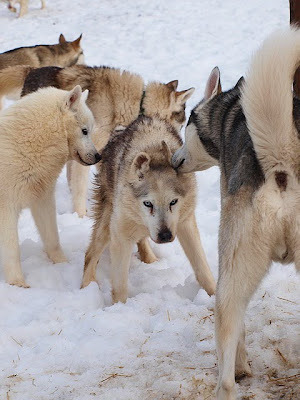 Cheyenne, exactly 14,5 years old lady greets with Hawky (Magpie x Ewok son, born September 2008), surrounded by the puppy pack. 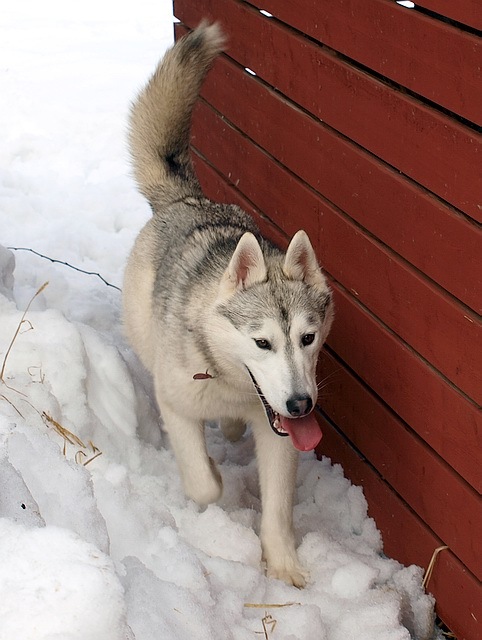 Lucky (aka Chatanika Kipp d´Amundsen) is one of the three puppies we kept from the "CH" litter. She is such a doll! You may remember her tough battle for life when she was just a wee baby. Lucky turned into such an adorrable young lady. She has a fantastic temperament, kindness of the heart (glowing all the way though her black eyes) and an iron will. Gotta love her! Ceeshiak, always young at heart! 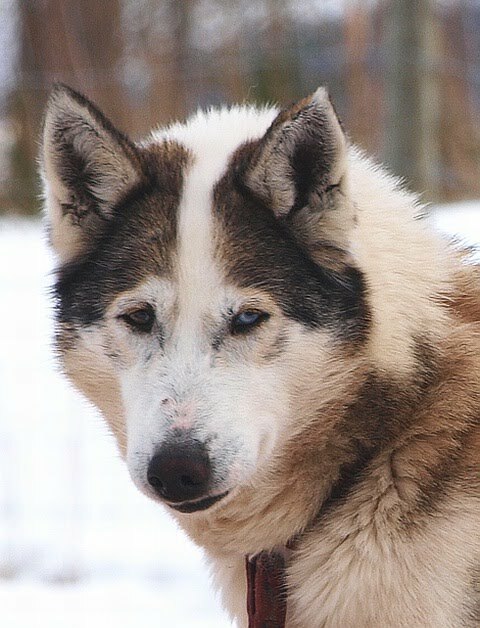 He and his brother Coryuk are from our "C" litter, born in May 1996. Ceeshiak is one of those guys, who stopped aging after a certain point. Just like his mom Pinny, who is 17,5 years old. 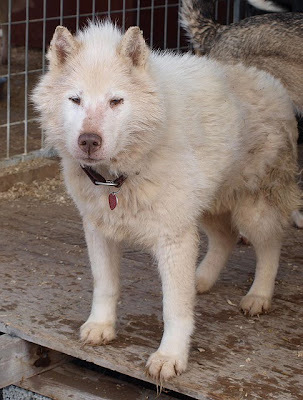 Ceeshiak is nearly 14, but his spark and comic tricks, and always cheerful, funny behaviour are everlasting! Coryuk. Gotta love these old guys! Her Royal Highness - princess and queen in one, Mouse (Anumati z Uralu). She must be one of the most beautiful dogs I´ve ever shared my life with. And smart beyond believing. Mouse gave us seven absolutely gorgeous puppies with Nugget (the "I" litter), this past October. She is an awsome mom! 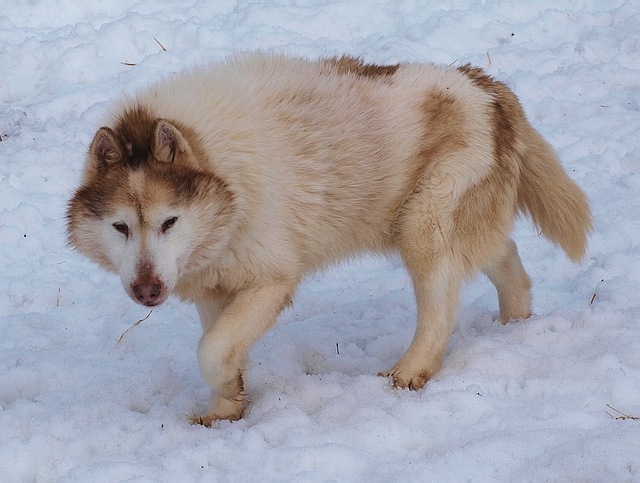 Mouse enjoying the snow, which is still plentiful and quite high at some areas of the dog yard. 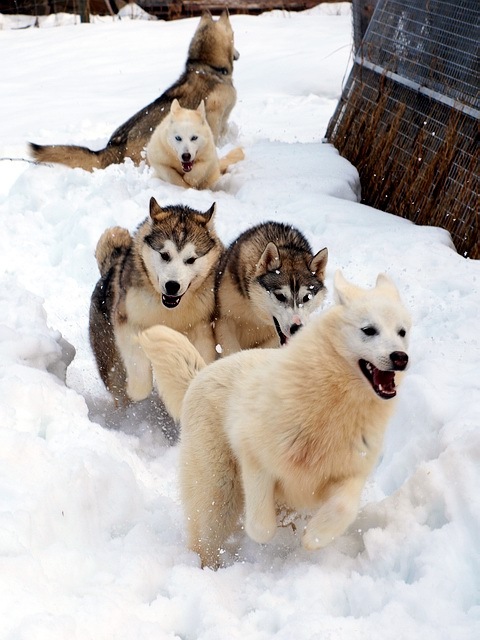 Dog in the front is Joey. Brother to Maggie (out of Rizey x Balto). 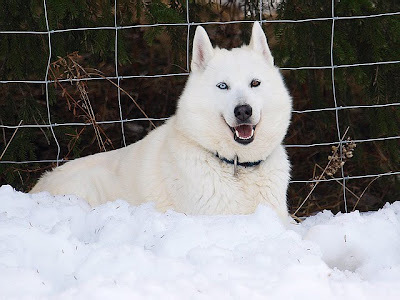 Joey was the pick of the "Northern Exposure" litter. Just like his sis and mom, he has a super friendly temperament and adores humans. Thanx for sharing all these lovely pix!!! I just love all your wolflike doggies!! !